New Characters: Rocket Raccoon for Marvel. Charlotte, Galford, Hattori Hanzo, Jubei Yagyu, Kyoshiro, Shiki, Ukyo Tachibana for SNK. Donovan for Capcom. The Ox for Data East. Mini-Logos – Strider (Genesis & EU Mega Drive cover) added to Capcom. 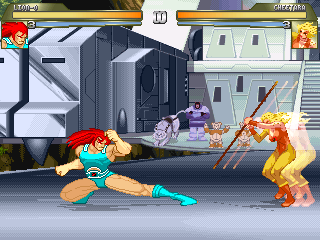 Burning Fight and King of Fighters 98 added to SNK. Game Index – Alien vs. Predator (arcade), Rival Turf (SNES) added. Sega is having a big sale on multiple classic (or classic-based) titles on PSN and X-Box Live. PSN has Golden Axe, SoR2 and Comix Zone on sale for $2.99 until November 29 while Live has SoR 2 and Phantasy Star 2 on sale for 200 MS points each from November 22 to November 28. There are other deals going on so check out their news post for details. 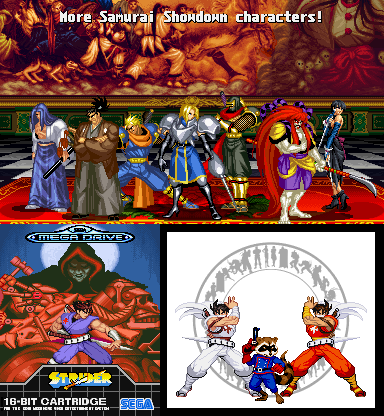 Shadi has updated his Arcade Quartermaster site with a lot of new game shrines for various Neo-Geo titles, CPSIII games and Marvel vs. Capcom 2. As always, Shadi comes up with inventive ways to use game graphics to make interesting shrines, so give his site a visit to see what he’s come up with this time! Kiwi has written an article that I’m sure quite a few fans of older games will agree with. Check it out on his 2D Will Never Die site and prepare for a possible flashback when you get to the second paragraph. BTW: I added a sprite of Nutroll, one of my own characters, to Illmosis earlier this week. 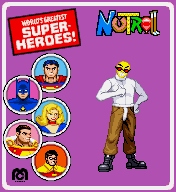 edit: Nutroll, with his new sprite and mini-logo, are now in the Graphic Generators.